The VonShef Sandwich Cutters are a great way to make lunchtimes exciting for children, and solve the age old parental dilemma of "how do I get my children to eat a healthy diet?" Whether you want to remove crusts or nurture a healthy attitude to food, these cutters make food preparation fun. With 15 fun shapes to choose from in an array of colours, there is something that every child will enjoy. They are also a good way to nurture any budding chefs. The sandwich cutters are not only great for sandwiches - you can use them to cut out other fun treats like toasties, jelly, chocolate shapes - even craft clay. 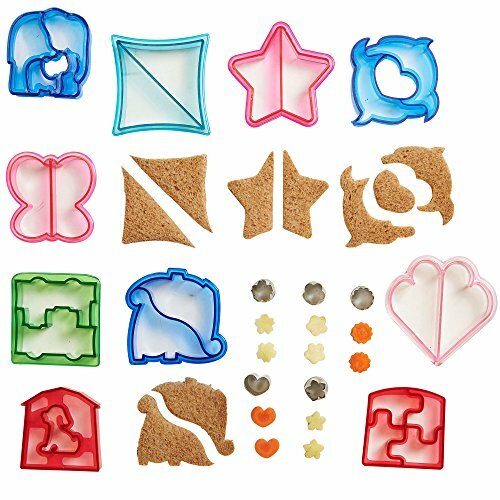 The plastic cutter shapes have no sharp edges, so children will love using them just as much as the shapes they create! The smaller, stainless steel cutters are tougher and therefore ideal for vegetables, cookies, soft fruits and biscuits, and also come with 2 plastic protector caps for safe storage. Easy to use, simply press down and twist to release the shapes. To clean, simply wipe under hot water.